Picture the scene. You’re enjoying a pleasant afternoon stroll along the coast path. You have the sun on your face and the sea breeze in your hair. The only sound you can hear is the gentle lap of waves against the shore below. All is right with the world. Suddenly, the peace and tranquility are ripped asunder by a large bloke with a rucksack, racing along the path as if chased by the hounds of hell. In his right hand, he is clutching a yellow wellington boot. He gasps a cheerful greeting and grins at you inanely as you step aside to let him pass. And then he is gone. If you were walking on the path between Portishead and Clevedon last Sunday, then I’m afraid that hulking, sweating, welly-toting brute was me. But in my defence, it was all in a good cause. Because it was the start of the RNLI‘s ‘Mayday welly relay‘, in which the wellington boot I was carrying is making its way from our lifeboat station at Portishead, around the south coast of England to Harwich in Essex. 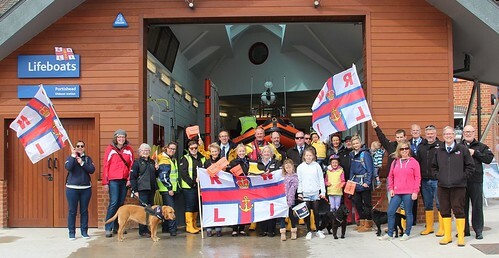 The aim of the relay is to highlight the RNLI’s ‘Mayday’ campaign, which is raising funds to purchase new protective equipment for our volunteer lifeboat crews. You can track the welly’s progress, incidentally, on its very own Facebook page. Here’s our team at Portishead just before the ‘off’. If you look above the middle flag in the photo below, you can just about see the welly itself. And yes, it has been ‘pimped up’ with LED lights. Obviously. The plan was simple. We parade the welly around Portishead marina and have a quick photoshoot, after which some of the other volunteers and I walk along the coast path to Clevedon. We meet up with more volunteers and strap the welly to the back of a Harley Davidson (as you do) for the rest of its journey to Weston-super-Mare. And we hand the welly over to the Weston lifeboat crew and get on with our lives. Unfortunately, I hadn’t quite got my timings right and we found ourselves nearly four miles from Clevedon with only half an hour left until the time I’d agreed to meet everyone at Clevedon Pier. Hence the running. This, inevitably, meant that I had to run even faster to meet my deadline. But it did a great job of highlighting what we were doing, why we were doing it and (crucially) that the RNLI and its volunteers will go to all lengths imaginable to save lives at sea. It also gave me a great opportunity, of course, to practice running off road, on technical terrain, wearing normal clothes and carrying a rucksack full of spare batteries (for the lights on the welly.) Which is always welcome. And yes, the welly did get to Clevedon on time. Just. It even made its way safely to Weston-super-Mare on the back of its Harley. And it is currently, I think, somewhere on the North Devon coast and still going strong. Giving it some welly, in fact. And no doubt continuing to leave chaos and confusion in its wake. This entry was posted in RNLI, Running and tagged Mayday Welly Relay, RNLI, Running by Simon Perks. Bookmark the permalink.